How easy is it to have a conversation about race and ethnicity on a college campus? Do people always hold themselves back from expressing real opinions on this difficult topic for fear of insulting others? Or can they express themselves fully, even at the risk of a heated discussion over core values? On Thursday, August 5th moderators Jill Severn and Jan Levinson from the Russell Forum for Civic Life in Georgia challenged a group of 28 of UGA’s residential advisors-in-training to tackle the topic of racial and ethnic tensions using the National Issues Forums issue guide “Racial and Ethnic Tensions: What Should We Do.” An hour and a half of dialogue left everyone in the room thinking more about these issues and how to cultivate more conversations on difficult topics with students on the UGA campus. In this view, we must focus on what unites us, not what divides us and provide equal opportunities for everyone. There has been much progress in bridging racial and ethnic divides, proponents of this approach say, and there will be even more if we eliminate racial preferences, which are unfair to everyone. We must also insist that recent immigrants assimilate rapidly. In this view we should acknowledge and accept differences, not blur them. The way to reduce ethnic and racial tensions is to first build racial and cultural identity. We will never learn to get along well with others until we first know who we are -- as individuals from different cultural backgrounds. We must allow minority communities and schools to set their own course, even if it means accepting some self-segregation. This approach calls for all of us to take an active part in finishing the job of integration. It is a job that we will have to work at by making continuous efforts to meet, talk with, and understand each other better. Proponents of this view oppose policies that encourage or accept racial or ethnic separation. Only through living, working and going to school together – and setting common goals through community dialogue – will prejudice subside. 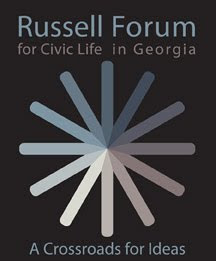 To read the full report on this forum, CLICK HERE or visit the Russell Forum for Civic Life in Georgia website. Thanks to our forum team - including volunteers Monica Pereira (recorder) and Nadine Cohen (observer) -- as well as our forum participants! And most of all to Kenya McKinley for inviting us to work with her staff during RA training. The discussion was great and we hope we'll have more chances to work with the folks in student housing again soon.